Sirius. 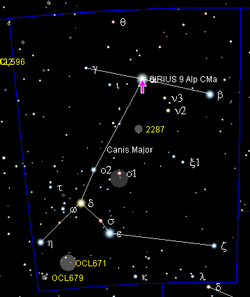 in the constellation, Canis Major, is the brightest star in the night sky (apparent magnitude -1.42). The apparent magnitude (m) of a celestial object is a number that measures its brightness as seen by an observer on Earth. The brighter an object appears, the lower its magnitude value (i.e. inverse relation). The Sun, at apparent magnitude of −27, is the brightest object in the sky. Magnitude is a logarithmic measure. It is measured in a specific wavelength or passband, usually in optical or near-infrared wavelengths. A full moon is −13 magnitude and the brightest planet Venus measures −5. The brightest man-made objects, Iridium flares, are ranked at −9 and the International Space Station measures −6. The Greek astronomer Hipparchus first invented our system of apparent magnitude. He gave the brightest stars a magnitude of 1 and increased the numbers for dimmer stars. About 300 years later Ptolemy of Alexandria created an encyclopedia of stars based on Hipparchus' work. The Persian astronomer Al-Sufi took Ptolemy's work and gave Arabic names to the stars some 800 years later. Medieval European astronomers simply translated Al-Sufi's work into Latin which is why many stars today have Arabic names. Apparent magnitude m is a measure of the brightness of a celestial body as seen by a person on Earth (without the earth's atmosphere). The brighter the object appears, the lower the numerical value of its magnitude. For example, Alpha Centauri has higher apparent magnitude (i.e. lower value) than Betelgeuse, because it is much closer to the Earth. Absolute magnitude is the apparent magnitude, m, an object would have if it were at a standard distance from Earth. The standard distance is 32.6 light years from Earth. The concept of absolute magnitude allows astronomers to compare the brightness of objects without regard to their distance. When measured using absolute magnitude the sun measures less than Sirius at only 4.8. Visual magnitude means the amount of brightness of a star on a numbered scale. It is the magnitude based on the sensitivity of the human eye. Photographic magnitude is different from visual magnitude because photographic film is more sensitive to blue light and radiation the human eye cannot see. ↑ "Magnitude". National Solar Observatory—Sacramento Peak. Archived from the original on 2008-02-06. Retrieved 2006-08-23. ↑ Nick Greene. "Star Magnitudes". About.com. Retrieved 20 September 2014. This page was last changed on 9 November 2018, at 04:54.